Oops - we don't appear to have a video for the Patriot D40. Would you want the paper on your desk and in your file cabinets to be searchable? Would it not be fantastic to instantly locate those files and print them out, email, or edit them as needed. Sounds futuristic at best, doesn't it? With the Visioneer Patriot D40 duplex color scanner and its powerful software bundle, you can scan and do all of the above, plus more. The Patriot D40 includes Visioneer OneTouch technology, and an advanced TWAIN driver that will allow you to communicate with hundreds of enterprise content management (ECM) and document image management (DIM) software solutions with the press of a single button. It will not only make your paper more productive but make you look good too. Most new users in document imaging are not scanner experts, so simplified, point-and-click solutions that deliver high quality images and integration with business applications are in demand. The Patriot D40 is a high speed, duplex color scanner that offers convenience and connectivity. With an amazingly small footprint, the scanner fits comfortably on any desk making it the perfect solution for small and large paper-intensive businesses that desire the capability to quickly convert paper documents into searchable PDF files. Corporations within the banking, education, energy, financial, government, healthcare and manufacturing industries can greatly benefit from the 6,000 pages per day scanning ability and the reliable paper-handling everything from business cards and checks to legal-sized documents and long medical or field charts. 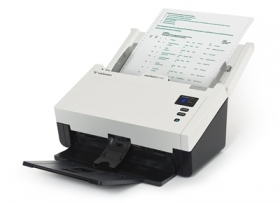 The Visioneer Patriot D40 color scanner scans up to 120 images per minute (ipm) in duplex mode, includes an 80-page automatic document feeder and has the ability to automatically scan documents into searchable PDF files through a Hi-Speed USB 2.0 connection. Designed specifically for desktop use, the Patriot D40 incorporates Visioneer OneTouch technology for eliminating multiple steps in sending scanned documents to predetermined applications or devices. For Mac users, Patriot D40 includes a fully featured TWAIN driver, ICA support, and a simple yet powerful Scan Utility, allowing you to get started right out the box. Visioneer Acuity enables your scanner to instantly improve the visual clarity of the scan, plus auto-crop, auto-straighten and auto-rotate, all with the touch of a button. Visioneer OneTouch OneTouch connects your scanner with a powerful set of settings so that with one touch the scanned document is automatically sent to email, your printer, a file folder, or to one of many cloud destinations. Nuance OmniPage Pro provides a precise OCR and layout retention solution, quickly turning scanned documents into editable, formatted text. The text can then be used in virtually any word processing, desktop publishing or web publishing program. Nuance PaperPort combines the efficiency of document management, the convenience of superbly scanned documents and the power of creating PDF files, to bring a new level of operational proficiency to your workflow. Nuance Power PDF is the smarter PDF software choice for businesses. Combining powerful functionality, superior Microsoft Office support, built-in intelligence, DMS integration, and intuitive ease of use, Nuance Power PDF provides everything you need to create, convert, edit, assemble, and securely share PDF files for increased productivity, enhanced collaboration, and improved compliance. The Mac TWAIN driver offers all of the features of Acuity Image cleanup built in. No 3rd party software needed. Blank Page Removal, Auto Color Detect, Auto Rotate are just a few of the standard features. It also includes a digital imprinter to add text to your images, the ability to read barcode data (3rd party software required to interpret barcode data), and Merge 2 Sides. If there is no scanning application on your Mac, a simple but effective scan utility is included, allowing you to take full advantage of all of the drivers' features. Simply put, set your driver preferences, select an image format (BMP, JPG, GIF, PDF, MPDF, TIF and MTIF), choose where you want to save your images to, and start scanning.